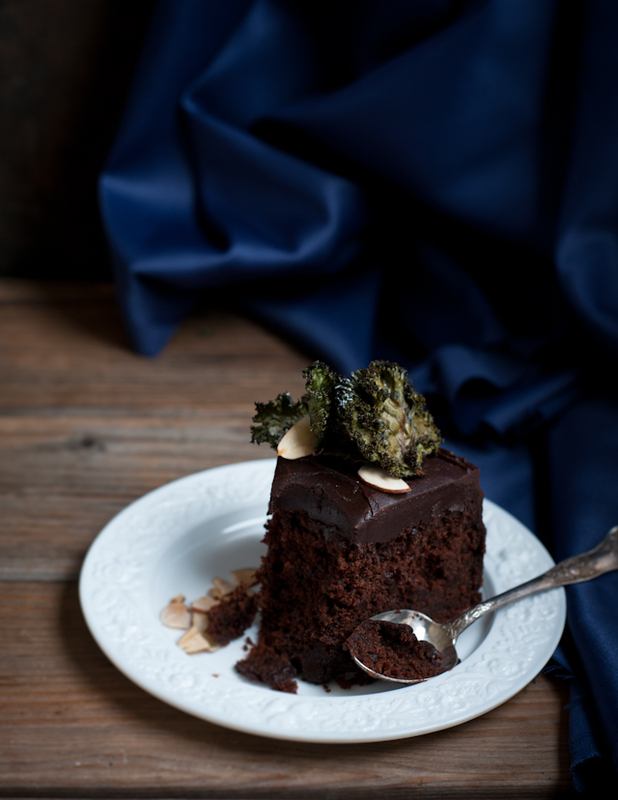 Desserts for Breakfast: Chocolate beet cake with kale chips and almonds, or the otherwise known as the "Eat Your Salad and Have Cake, Too" Cake. 1. 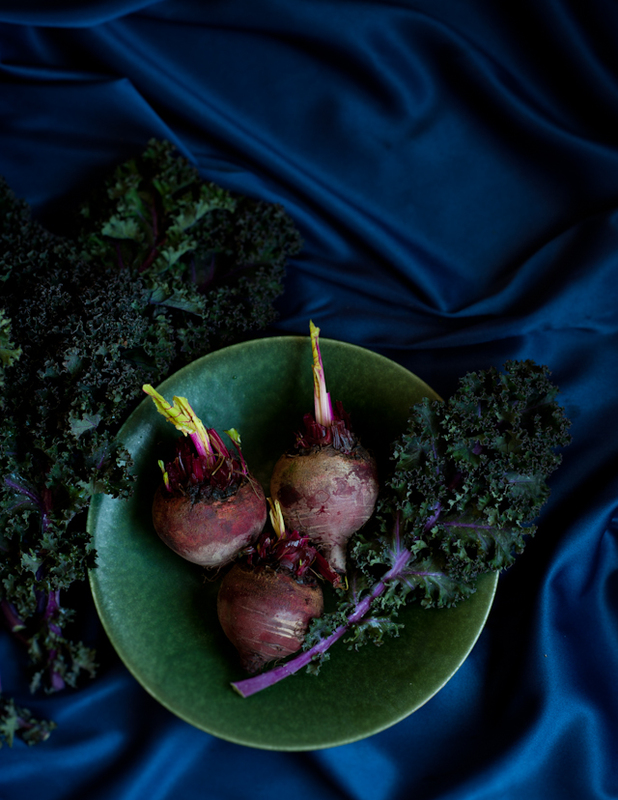 Preheat oven to 350 degrees F. Wrap the beets in aluminum foil and place on a baking tray. Roast for 30 minutes or until fork-tender. Remove from oven and let cool completely. When cool, cut off the tails, and peel the beets. Grate the beets and set aside. 2. Prepare a bundt mold by greasing and flouring the inside. Keep the oven at 350 degrees F.
3. In a bowl, whisk to combine the flour, baking soda, baking powder, salt, and cocoa powder. Set aside. 4. Put the butter in a mixer bowl with the paddle attachment. Cream until light, about 2 to 3 minutes. Add the brown sugar and granulated sugar and continue beating on medium until light and fluffy, about 2 to 3 more minutes. Add the eggs one at a time, beating well between each addition. Beat in the vanilla extract. 5. In two stages, add in the flour mixture, alternating with the creme fraiche and the whole milk. Mix well until combined but do not overmix. Pour in the hot coffee and mix. Fold in the grated beets. 6. Pour the batter into the prepared pan. Bake for 40 to 45 minutes, until a toothpick inserted in the center comes out cleanly. Remove from the oven and let cool on a wire rack at least 20 minutes before unmolding from the pan. Let cool completely on the rack. 1. In a heatproof bowl, melt the chocolate over a pan of simmering water. 2. In a saucepan, heat the cream and butter just until simmering. 3. Pour the hot cream mixture over the chocolate. Remove from heat, and let sit for a minute or so. 4. Stir the cream into the chocolate until smooth. Cool until tepid and slightly thickened, and pour/spread onto the cake. 2. 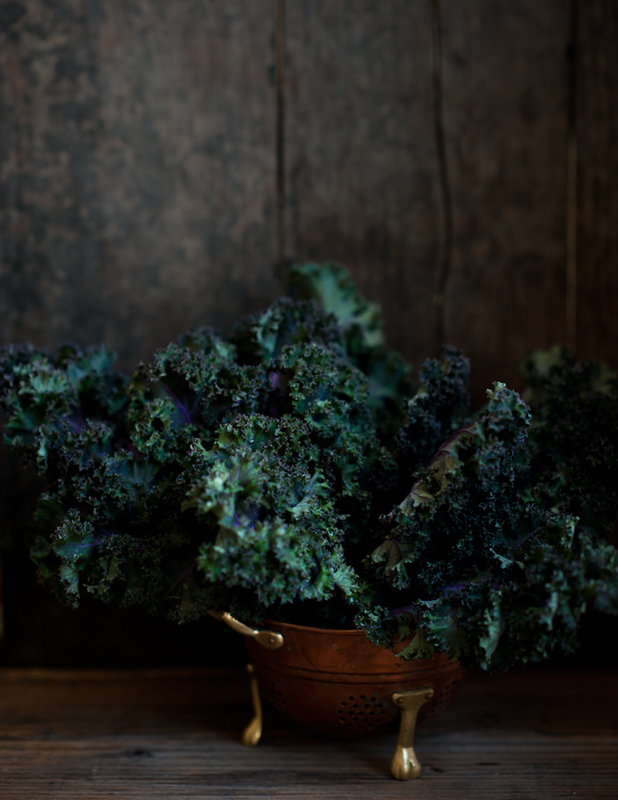 Chop the kale into medium-sized pieces. Toss with olive oil. Spread in a single layer on a baking sheet. Sprinkle with flaked sea salt. Bake for 20 minutes, or until crisp. Remove from oven and let cool completely on a wire rack. 3. Meanwhile, spread the sliced almonds out in a single layer on a baking sheet. Toast in the oven for about 10 minutes, rotating once, until lightly golden. Remove from oven and let cool completely. 4. 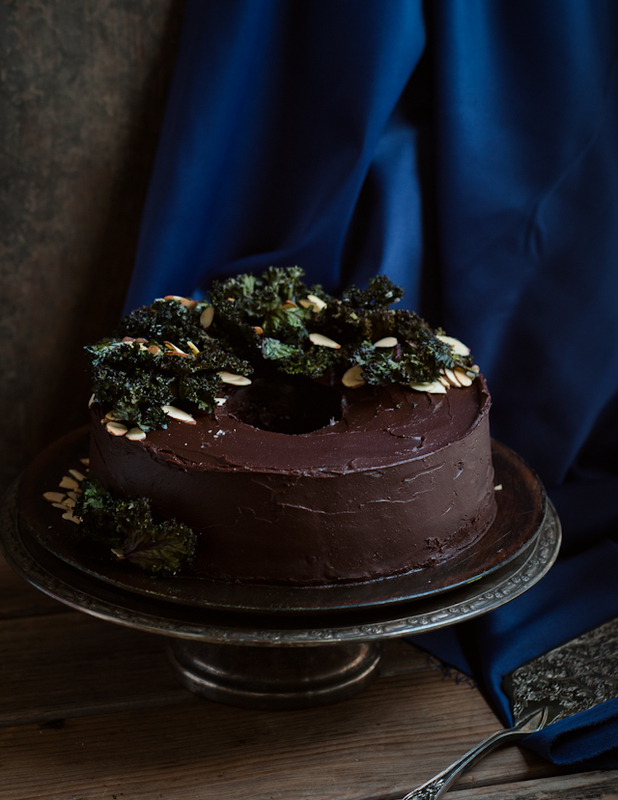 Either layer the kale chips and almonds on the cake, or smash into crumbs and sprinkle on the cake for a bit of savory bite. 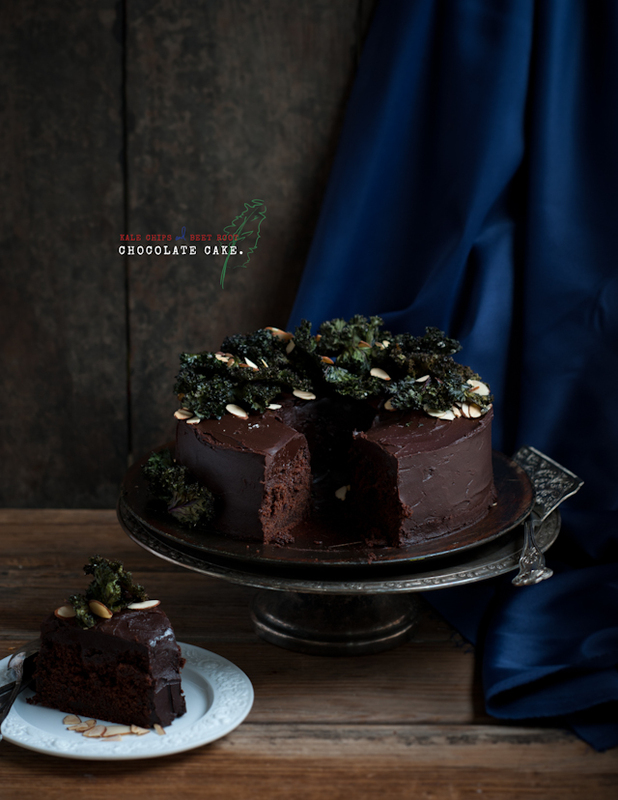 Note: Use the kale chips shortly after they are made (or keep in an airtight container), and add them to the cake just before serving. The kale will soften if left to the open air and on the cake too long. The title of the article is Eat Cake for Breakfast and Lose Weight. Do you dare rebrand your site as a weight-loss resource? Oh, I'd never thought of a chocolate kale smoothie. That's interesting! Yes it is not nuts...such a creative recipe! Pretty sure this is the coolest cake I've ever seen in my life. Yep--definitely. I am sooooo fascinated by this idea!!! You are a genius. Cake that looks like cake, tastes like cake but is basically a salad. This cake shows there are no boundaries when it comes to desserts, or food in general. Great recipe and, as has already been said, genius idea! Those textures together must be fantastic. I've just started roasting kale myself (also late to the party) I wonder if I could persuade my husband to eat kale if I made this. how luscious does this look!? incredibly innovative! I am intrigued! Now that you've made kale into a dessert, what's next?!? I'm glad this post surmounted the drafts folder.